Learning How to Dance in the Rain ....: Chemotherapy No 2 - what a day!!! Well my bed has never felt so good!!! I am feeling absolutely shattered but thought I would attempt to blog as things were still fresh in my mind as I am unsure what tomorrow will bring. So forgive me in advance if you end up reading a lot of gobbledygook!!! 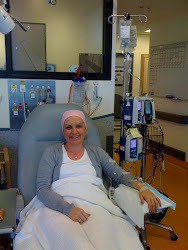 I am home after a marathon session at chemo today. The day before you have to take steroids to help with the side effects that may arise from the chemo - however these drugs have side effects of their own. They keep you awake!!! So although I really needed to sleep last night I was still awake at 4.45 this morning - not the best start - especially with how things turned out today - but am home and happy to have got no2 done!! Yeah. It is still school holidays here - a friend had offered to have the girls today so the plan was they would go for the morning and be home after lunch as I expected to be in by 10 and out by 1pm - how wrong was I.
I was in by 10 but only ended leaving at 6 pm!! In fact I was the last patient there - the chair next to me had seen 3 people pass through whilst I sat and sat and sat!! All started off pretty well - my friend jen took me - we arrived on time where taken in - the IV although painful was inserted without a problem - the line ran well and thank God lasted all through the 8 hours of drama!!!! The first step is to flush the line and then iv antinausea and then the big guns - doxytaxel!!! On the other side of the room - the staff had rushed over to assist with a lady who had an adverse reaction to one of her drugs - she was sorted out - and I did have a sneaky feeling that I should anticipate a bit of action too. Listen to that still quiet voice. A very nice dr was on duty and reported that he was happy with my cell count and I was good to go. B had popped down from work so jen went to do a few jobs get a coffee and come back. Well she missed the highlight hehe!! Literally as the taxotere began coursing through my veins my face went red like a hot poker , I came out in a rash and my heart felt like it was going to beat out of my chest!! The staff were amazing - fast and so efficent - the Dr had been tangling around to see how I would respond - so he was there in a flash. The drip was stopped instantly, I was given hydrocortisone and pheregen IV and soon al began to settle - took my breath away but all settled well. So then we had to wait for 30 mins for me to recover and then they were going to "challenge me again" in there words - this time the drip rate would be set very much slower and gradually increased over time. During this I also wear the fabulous icemitts which are so freezing - your fingers are sore and like ice - but all worth preventing losing your nails. I was monitored very closer with lots of people coming by to check how I was feeling. Such lovely Drs and nurses there today!! Poor Jen got quite a fright when she walked in as it had all literally just happened when she walked back in - she couldnt believe it and was so glad that B had been with me!! So that was drug no 1. After that flushed again and set up the next one!! One would have hoped this one would be fine - haha - well I was on a roll . As soon as this one went in my eyes began to itch and get sore and scratchy - at first i thought I just had something in my eye but no it just kept getting worse -so once again all came to a standstill and they called for the Dr. They just weren't sure if this was going to progress to something equally as exciting as the first drug. My consultant was seeing another patient so they were waiting to chat through the details with him - in the interim I believe a lot of googling was going on re this particular side effect as they hadn't actually had that happen with anyone before - it had to be me !!!!! The Dr who had checked me in orderd some eye drops from the pharmacy to bring some relief and quite a while later the consultant came we had a chat - I said I could manage wsnt feeling to much else so the plan was to run it a lot slower and she how we went!! So off we went again - jen popped the eye drops in for me - all went okay - I did get more sinussy symtoms but nothing too bad and weirdly an indigestion. But I pushed through and we made it to the end. It was also amazing as when I went to the Look Good Feel Good program I met a lovely lady that I really clicked with - we havent had contact since - but who should walk in for her last chemo - my friend. What are the chances - we are definitely meant to get together. Unbeknown to me she had actually sent me a text but I hadnt received it - I met her hubby and we had a great chat - and are all planning to get together soon. Just great! So as people were coming and going I was still sitting. The girls were with my friend and her girlies at the movies and as I said I had been hoping to be home by 1.30. Thankfully I had given her a key so they were able just to come hom to the farm and hang out together. Jen had also offered to have the girls over for a Shrek marathon and sleepover. They had a Barbie marathon a few weeks back where it was all pink adn girlie - well tonight the theme was green and brown. Ab had spent yesterday making choccie cupcakes with green icing , handmade choccies in green mini cupcake papers amongst other things. Green and brown clothed were packed - what fun!! Jen left me close to 5 to go and relieve poor Jodes from her shift - so thank you lovely ladies for just jumping in !!! B had finished work so he came and sat with me for the remainer of the time - the nurses were so sweet and very sympathetic that I was ending up spending my entire day there! The 3rd rug was initially to be run over half an hour but considering the track record of my day - they thought best to ease me in gently - so another hour for me!!! They were cleaning all the beds around me etc as I waited - the chemo unit closes at 6 - so I was just going to make it!!! When the last drop of Herceptin was in - i had my shoes on , my bag dusted off and ready to jump off that bed after the final flush!! I had left my car at Jens so b drove us there to pick it up which worked out well as I could say goodnight to my beautiful girls as I hadnt seen them all day and was good to reassure them that all is okay. After a quick cuddle and a few I love yous I was off as I didnt know how long I could function for. They were all happy dressed in their green and browns and tucking into hot chips!! B had picked up some takeaways for us - so food and bed for me!! So we will see what tomorrow brings - I am so full of drugs and steroids I am really hoping that I will sleep as I am exhausted but the nurse did say they may keep me awake - and I have managed to type this so hoping thats not a bad sign!!!! Am sure I will just snooze tomorrow in any case - so all good. Infact even despite todays dramas I am feeling good and positive - I am almost half way through the chemo part at least - I reconnected with an new friend and was mightly helped by 2 old ones!! The staff at the hospital were supportive and caring - I left with a bag full of prescription meds to attack the side effects - so here goes!!! And yes my hair is going mightly too - had to wear a hat today as my bald patches are really showing - but hey I cant complain - it will come back and my skin regime has never been so thorough!!! My beautiful friend it is so very hard for you and so very painful for your family too. Your hair will grow back very quickly I promise I finished in the November by Christmas I was able to go out without a wig/hat. It will also grow back even thicker and more amazing than it was before. Love you so much would love to be there with you. Will send a long newsy email so that you are kept up to date with the wedding news. Lots and lots of love to you Brian Abi and Caitlyn.